Why Not: Shut Down M St. on Weekends? Traffic Jam on M St. by M.V. Jantzen. Today for his occasional “Why Not” series, GM turns to the ugliness that is M St. on a summer weekend. So he asks: Why not shut down M St.? It’s an idea GM thinks about every time he sees gridlock on M St. There is a concept called a traffic tipping point. At the center of this concept is the observation that once the numbers of travelers passes a certain threshold, the entire system seizes up. Thus, a very small increase in the number of cars on an already crowded road can result in huge delays due to congestion. (The opposite has also been observed: a small reduction in vehicles on a gridlocked road can result in significant reductions in delays). Once it’s warm, on every Saturday by about 2:00 PM, a traffic tipping point is passed on M St. Traffic comes to a standstill. It can take 20 minutes, if not longer, to get from one end of Georgetown to the other. What GM proposes is to close M St. to all non-bus traffic from noon to 8:00 PM on weekends during June through August. Wisconsin Ave. would remain open, however all traffic would be directed straight down to K St. (and out to either Rock Creek Parkway or downtown). Drivers would still be able to come in to Georgetown from P St., Q St., Reservoir Rd., and Wisconsin Ave. Drivers coming from Virginia would be directed to either Foxhall or the Whitehurst. From Foxhall they would circle around and come in from Reservoir. Those who head down the Whitehurst could come through the West End up to P or Q St.
Cars coming down Pennsylvania Ave. or M St. from the east could be routed down 29th St. to K St. Ideally they’d go straight into one of the many garages on K St.
Would that be a pain? Absolutely. But it probably wouldn’t be worse than the current situation. And the best part is that we could then reclaim four lanes of M St. for pedestrian use (two lanes would be used for buses, which would be a great thing in and of itself). We could host a Feet in the Street like DDOT is proposing for K St. Georgetown shopkeepers and other vendors could set up tables and tents all along the street and we’d still have a ton more sidewalk space than we have now. GM firmly believes that by shutting down M St. we wouldn’t be cutting off our nose to spite our face. We’d have bigger crowds, they’d just come different ways. And by keeping Wisconsin Ave. open, residents wouldn’t be trapped (and GM also believes that by removing all turns at M and Wisconsin, there won’t be nearly as much of congestion on Wisconsin as we have now). It’s a plan that would have to be thought out a lot more than GM has (for instance, do we close off 34th St.’s access to the Key Bridge?) and it would take a huge amount of courage to implement, but the situation we have now is unacceptable and hurts both residents and visitors. Why Not: Secede From Washington? Why Not: Build More Bike Lanes? Why Not: Bring Performance Parking to Georgetown? Why Not: Allow Some Streets to Return to Cobblestone? Why Not: Bring Back Those Old Street Names? Anthony Lanier proposed a similar idea. If Lanier is so progressive on planning issues, why is the Georgetown BID so resistant to change. Is he not engaged in the BID’s role in planning debates? P and Que and N and O are already strangled with traffic on weekends. So is 34th, 33rd, etc. Taking all traffic off M and forcing people to come into Georgetown thru the residential streets would cause chaos beyond belief. Perhaps we should eliminate all parking on M and Wisconsin on weekends. And BID could hire a couple of traffic cops to direct traffic to the available parking lots. And parking lot owners could stop ripping off the public with outrageous rates. Being a gentleman’s neighborhood, Georgetown should be closed to all vehicular traffic that is not horse-drawn. You and Anthony Lanier should form an alliance and make this happen. Anthony tried and the rigid, resistant forces of Georgetown shut him down. But don’t give up. Push through. Great idea. Hello BID board, are you listening? This idea, while interesting, would simply push traffic onto nearby residential streets, and just move the gridlock onto those side streets, making them louder and noisier, more unpleasant, and more crowded. Imagine the traffic jams on P Street, for example, and what they would be like for residents on that street. As it is, one can get around the gridlock on M by choosing alternate routes on that allow one to go around it – that would no longer work either. All in call, this would be not good at all for the neighborhood. It’s so hard to make any transportation planning changes when the neighborhood provides free or subsidized parking for drivers. I think free & subsidized parking has to go first (through market-rate meters in the neighborhood and the commercial streets) and then other changes will be easier to envision. That’s because market-rate meters eliminate the 30% of traffic that is circling the block looking for a free spot, and ensures residents that they will always have an available spot near their home. I really like this idea, or some sort of similar compromise. I find the sidewalks to be so overcrowded and narrow that you can’t fully enjoy the day–you are constantly dodging pedestrians. One solution might be to get rid of on-street parking on M Street and to widen the sidewalks on each side. Doing so would allow for more pedestrian traffic as well as the potential to add trees. Newbury Street in Boston, which is a similar shopping destination, has these great wide sidewalks that can accommodate the traffic. There are several parking garages now, so I feel that those who choose to drive into gtown can find ample parking. I’ve also felt that trying to park on M Street just doesn’t make sense to begin with. It’s so congested that any attempts at parallel parking put everything to a halt. Dave and EG: I understand the concern that this would push more traffic into the side streets, but I think that wouldn’t be a problem. The reason P St. gets backed up is congestion on Wisconsin Ave. The reason there’s congestion on Wisconsin Ave. is due to congestion through the Wisconsin Ave. and M intersection. If you remove that intersection entirely, traffic will flow faster up and down Wisconsin, and thus traffic wouldn’t back up on P St.
Ken: I agree that performance parking should be a priority above this idea. One of the reasons people are clogging M and Wisconsin now is the vain hope of finding a parking spot on those roads. With performance parking, they’d find a spot, it just would come with a price. Hopefully, if they want to stay longer they’ll just go straight to a garage and not clog the streets looking for free parking. Nick J: I’d love to get rid of all the parking on M St. all the time, but that would be even more impossible to get through than my idea. The business are convinced that they won’t have any customers without it (I disagree strongly) and during rush hour those lanes are travel lanes. So converting those lanes to a sidewalk would impact rush hour (although I’d argue that it would be temporary until people changed their travel habits). I think its a great I idea. I also second Nick J’s thought that sidewalks in Georgetown are far to narrow for the amount of pedestrian traffic they receive. Four lanes of traffic + two lanes of parking, and what…6′ wide sidewalks? It seems way out of balance to me. The worst is on Halloween. They fence off the sidewalks to keep the streets clear, forcing the already crowded sidewalks to completely seize up. If they had any sense at all, they’d at least close M Street to vehicular traffic on that one night. I think that we should put together a transporation plan for Georgetown – and so long as we build 50 or so Bixi Bike locations or Smartbike, whatever — within Georgetown proper – then we could close the whole neighborhood, with the exception of a few streets (except for residents ,buses, and bikes) for the weekend only. Why doesnt Georgetown get serious about this? The neighboorhood would be a perfect model for a good, dense, bike sharing program similar to Montreal and more people would visit and shop, etc. 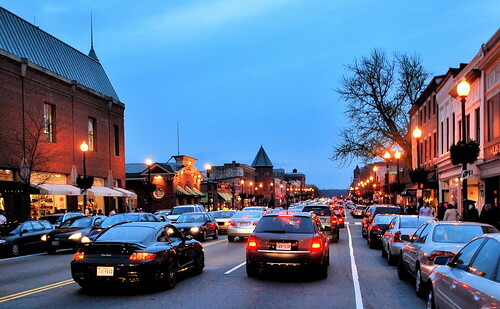 G’town could be one of the best neighboorhoods in the world if done right, and DC seems to ignore the areas that have potential to be world class. I wonder whether M Street really need the parking lanes open during rush hour? Whitehurst Freeway, as much as it is an eyesore, does help traffic bypass the gridlock on M Street. Wouldn’t that be sufficient for those driving downtown? Perhaps the sidewalks will expand when WMATA separates the Blue Line…those who work in Georgetown wouldn’t need to drive. Interesting to think about. Furthering CL’s thought, maybe Halloween is the starting point. If it works well on Halloween, there’d be more of a track record to argue from. They used to shut down M St. to traffic on Halloween, and it was great for M St. pedestrians, but there were concerns about the driving in the residential streets with all the little kids around. So they shut down the side streets and force all the traffic on to M and Wisconsin. Personally I’d like to see a compromise on Halloween, keep the walls but take over the parking lane. Perhaps they will need to shut down M street down for a few months if and when the new owners start renovating GTP mall? Otherwise, I imagine it would be a nightmare!